Early last year I was given the opportunity to review the 2003 anime adaption of Kino’s Journey. Although my experience left me with fairly lukewarm feelings, it wasn’t enough to stop me wanting to experience more of the franchise’s media. Flash forward to now and I’m here to take a look at the first volume of the manga adaptation of Kino’s Journey: The Beautiful World from Vertical Comics. The story follows Kino and their talking motorcycle, Hermes, as they travel the world. Together the two visit various countries and stay for no more than three days, a self-imposed rule set by Kino. Kino believes that three days is enough to learn everything there is to know about a country’s people and customs; after that they search for their next destination. The places the two visit are extremely varied and never what they appear to be on the surface. Just this book alone sees us visit a land filled with robots (which seems empty of humans), and shows us Kino’s hometown, the Land of Adults, which holds a dark secret. Kino doesn’t really know why they’re on this journey – if they just want to see new places or if they’re looking for answers to some unanswered question – but, whatever the reason, their curiosity pushes them ever forward. Interestingly, for those of you familiar with Kino’s Journey’s various anime adaptions, the stories have been rearranged somewhat for the manga. Usually we don’t see Kino’s past until closer to the end of the anime. This change is a welcome one for explaining how Kino came to begin their travels, but it does hinder this first volume’s ability to showcase what Kino’s Journey is really about. This move also changes the ambiguity surrounding Kino’s gender, something the rest of the franchise puts off disclosing and thus something I too have not explained in this review for those of you who aren’t already aware. With almost half of the book being taken up by Kino’s story in the Land of Adults, it means that Volume 1 only has enough room left to explore one new land. As interesting as Kino’s backstory is, I’d actually rather have explored a couple of lands with Kino and flashed back to their homeland later. For existing fans of the series this isn’t likely to be a problem but I think it results in newcomers needing to commit to a couple of volumes before deciding if they like this manga or not. As someone whose only experience with Kino’s Journey is the 2003 anime series, I have to say that the manga was a much better read than watching the old anime. Mangaka Iruka Shiomiya has brought Kino and Hermes to life with attractive designs and a great deal of emotional variety. Yes, somehow even the feelings of a motorcycle are well portrayed! The artwork is very clean and Shiomiya makes use of large panels to show off Kino’s surroundings without the risk of the pages becoming crowded. There are a couple of sneaky sequences where it looks like Hermes has been rendered as a 3D model as opposed to more traditional artwork, but this can be forgiven when it’s not always the case. In the back of this volume there’s an afterword from the original light novel author, Keiichi Sigsawa, where they talk about how it’s taken 17 years (as of 2017, when this volume was released in Japan) for the series to achieve a manga adaption and that they were worried the series was cursed. With the light novels unavailable in English, I’m glad this manga finally became a reality because I feel as though Kino’s Journey works better as an episodic manga or light novel than it does as 25-minute chunks of animation. I find it easier to focus on the world around Kino as a manga and feel this is a valid alternative to the anime if you bounced off that. This release comes to the West thanks to publisher Vertical Comics and includes a selection of colour pages at the beginning. The book has been translated by Jenny McKeon (who also translates Miss Kobayashi’s Dragon Maid and Bloom Into You) and reads well. McKeon has done especially well to work around gendering Kino, something that the franchise does consistently beyond Kino’s backstory. 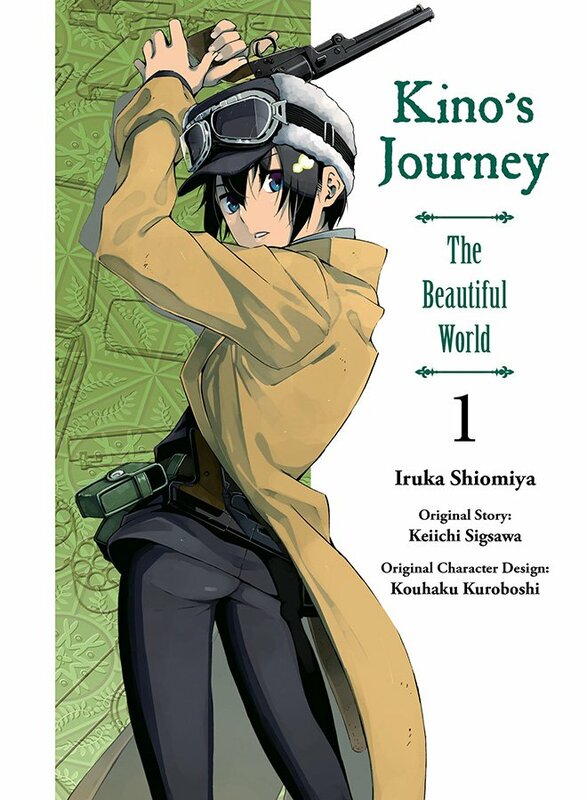 Overall, the first volume of Kino’s Journey: The Beautiful World is an entertaining read. Existing fans of the series should have a lot of fun reading this book, while newcomers should stick with the series for at least another volume, given how much time Volume 1 spends on Kino’s backstory. Regardless of your feelings after this first entry, I’m sure the commitment will be rewarded. A free preview of this volume can be found on the Vertical Comics website here. Tsutomu Nihei’s mecha manga returns in this extra large, expanded edition. From the creator of Yuri!!! on Ice comes the story of a man unlucky in love who finds himself the centre of four women’s affections.